Our mega-mile All-Season tyre test sees a welcome uptick – and then some – in fuel economy. If only the ride (and residuals) were still as good. Also, the ‘World’s Largest Electric Vehicle Rally’ heads through the Alps. The northern stretch of the H2 Gotthard Pass reopens on Friday. Poland marks first ever death-free day on the roads. The number of foreign drivers fined for traffic offences in Belgium jumped by 50% last year (to 300,000). Fuel economy recovered but still question marks over ride (and residuals). All-Season tyres: good value and widely available too. We even found some in war-torn Ukraine. Apart from the comfy ride, the most immediately impressive quality of our Range Rover Evoque was the fuel economy. Thirty six point seven miles per gallon is not amazingly frugal but it was much better than we expected of our first ever SUV, especially since it spends so much time at full throttle thanks to the puffy 190bhp, 2.2 litre diesel engine. Irritatingly, that dipped to 35.3mpg after we fitted All-Season tyres at the 24,000 mile mark. It remained stubbornly at that level to the point we gave up checking. So it was a really great to discover recently that, presumably due to the warmer weather, average economy has now improved to 37.7mpg, i.e. better than ever. Despite the Range Rover Evoque in general having the UK’s best residuals, according to CAP Automotive (via Motoring Research), our fully loaded five door Dynamic has lost a third of its value in fifteen months thanks to the mileage. Drives around the Baltic, to Gibraltar, Ukraine and side trips to Brussels and Paris – plus weekly schleps up and down the M1 – have seen nearly 42,000 miles slide under the wheels since we took delivery in March 2014. We might have to sell it to prevent a truly catastrophic loss in value as it ticks past 50,000 miles. The next owner is going to think the odometer has been fiddled upwards. None of that is the tyres’ fault though. Overall we are very pleased with our set of All-Seasons. Financially we’ve broken even since they cost the same as the summer equivalents while the initial dip in economy has been compensated by the subsequent rise. The only slight niggle is the ride. 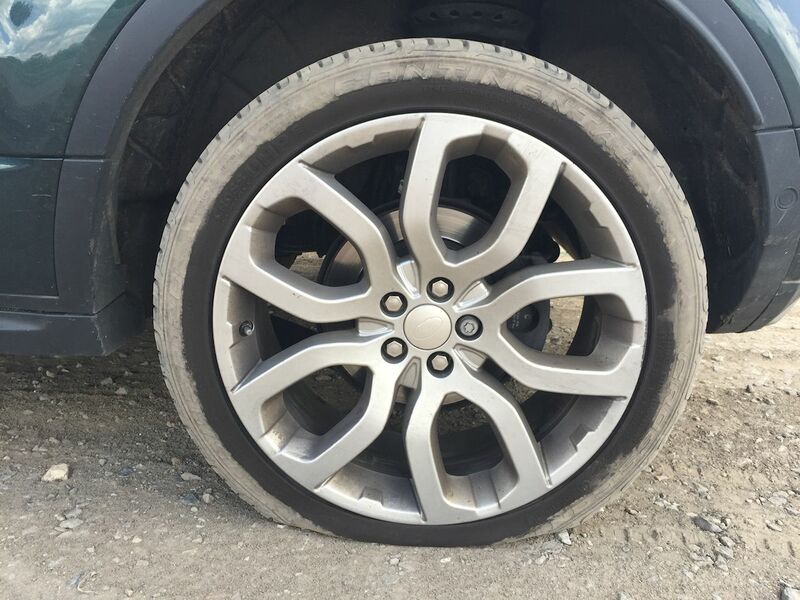 The Evoque is still comfy – a quality not to be underestimated when doing mega miles – it’s just not as overtly pillowy as it was on its initial set of summer tyres. Recap: we bought All-Season tyres because the M+S (mud and snow) markings make them a legal alternative to the so-called ‘winter tyres’ demanded by many European countries in snow and ice. See more on Winter Tyre Rules. 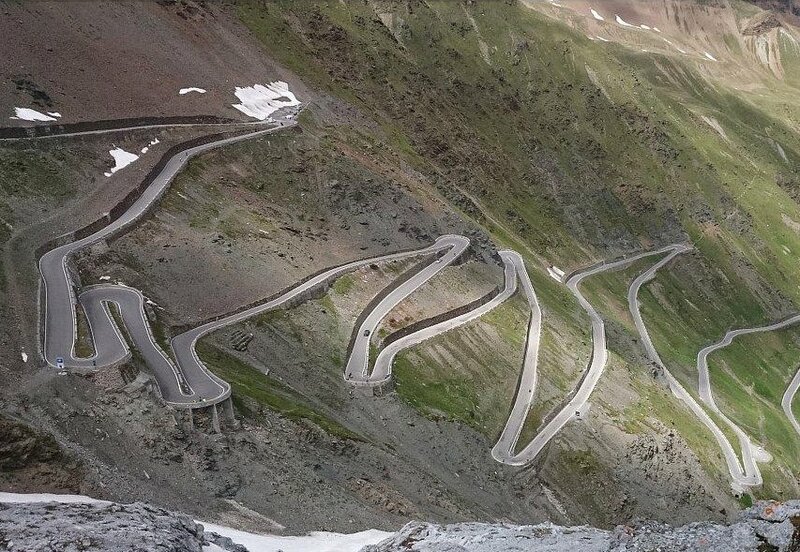 Billed as the ‘world’s largest electric vehicle rally’ with 90 vehicles – though last month’s eTour claimed to have 1,000 vehicles – last week’s WAVE Tour included Stelvio (above), Bernina and Fluela Passes on its way from east Germany to the Alps. Photo WAVE Trophy. See these roads on PassFinder. SWITZERLAND. It might not look like it from the webcam, but work to clear the rock fall which shut the north section of the H2 Gotthard Tunnel in the Schoellenen Gorge last month is nearly finished. The road reopens at 16:00 on Friday according to TCS. This stretch is a long term construction site, until 2019, with alternate traffic but work will be suspended through July and August to allow better access to the pass during the busiest times at the Gotthard Tunnel. POLAND. Monday 8 June was the first day no-one was killed on Polish roads reports NewPolandExpress.pl. ‘I don’t remember a day like it,’ says the former head of Warsaw’s traffic directorate. The average is nine deaths per day. The authorities put the clear day down to new stricter rules. Reportedly, any driver caught at more than 50kmh in a built-up zone loses their licence (? caught at more than 50kmh over the limit, Ed.) The authorities have a target to cut road deaths from 3200 to 2000 over the next five years. Numbers fell by 3% last year and by 17% since 2010. BELGIUM. It emerged last month that the number of foreign drivers fined for traffic violations jumped 49% last year to 299,017 according to LeVif.be (and widely reported elsewhere). The jump has been ascribed to better organisation and more speed cameras. The most common culprits are the Dutch, accounting for nearly 100,000 speeding offences, but 173 British drivers were caught driving under the influence of drugs and 621 French using mobile phones at the wheel. There’s no mention of whether the cross-border prosecution directive introduced in November 2013 played a part.